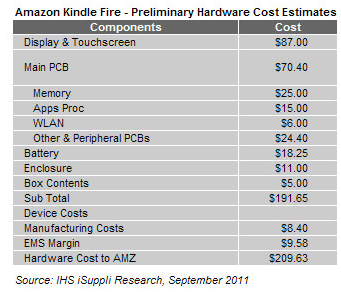 Amazon’s Kindle Fire tablet has been estimated to cost $209.63 to make according to component analysts IHS iSuppli. This would mean that Amazon is selling the Kindle Fire at a hardware loss of $9.63 per unit as it is currently selling them for $199 USD. This cost includes some manufacturing expenses as well, with the pure hardware cost estimated at $191.65. This doesn’t include other items like logistics and marketing costs however, which could actually make the costs slightly worse. The $199 price was universally lauded as setting an aggressive target for other companies in the tablet space, especially those competing in the lower-to-middle end of the Android tablet range. Retailers like BestBuy have been dropping prices aggressively on tablets, with the HTC Flyer getting a $200 price drop to $299. Amazon’s aggressive stance in the pricing market should cause some consternation among those looking to place their tablets at the value end of the scale. Much like Apple, Amazon also has a far more extensive array of content offerings to entice users with its MP3, movie streaming and extensive Kindle book library. It is likely that Amazon expects that the losses it is taking on selling the Kindle Fire will be made up in the amount of content purchased by owners of the devices. This is a similar tack to the one it takes with its ‘Kindle with Special Offers’ devices. These display advertising to users in exchange for Amazon subsidizing some of the hardware cost. In its release, iSuppli suggests that Amazon is taking this model one step further and attempting to establish an ‘umbilical’ that will allow it to sell Kindle Fire owners other products through Amazon once it has them used to purchasing digital content. Thereby financing its loss on the Fire by selling its purchasers DVD’s, coffee makers and other items. iSuppli says that, by its estimates, Amazon stands to make $10 on each Kindle Fire sold if you factor in the expected sales of digital content per device. I’d say that Amazon feels that far more content sales are in order for each as I highly doubt it is in this for a measly $10 per Kindle Fire.